If I climb up into Heaven, Thou art there; If I go to Hell, Thou art there also. Even there also shall Thy hand lead me; And Thy right hand shall hold me. 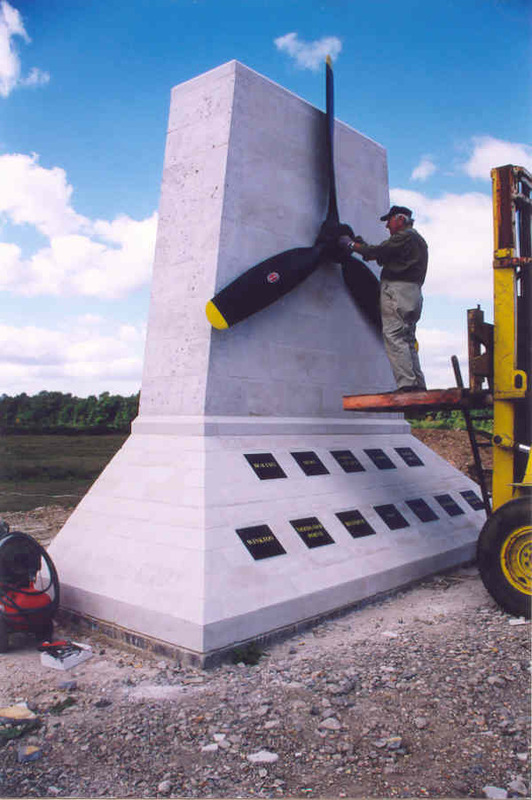 The memorial standing on the western boundary of the wartime airfield of Holmsley South sprang from the desire to commemorate all those people who had served on the New Forest airfields during and immediately after the Second World War. Many younger people have no conception of what was happening in the area all those years ago, yet what occurred then helped in no small manner to secure the freedom we enjoy and take for granted today. Had the War been lost, Great Britain would have become part of the Third Reich, a vassal state, with slavery, concentration camps, murder, torture and intimidation being everyday features of life, as they were in those countries that were occupied by Nazi Germany at that time. Our wartime leaders would have been executed by Hitler’s Nazis and, in addition, we would all now be speaking and writing German. 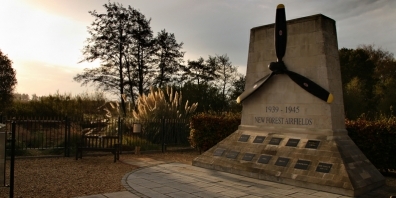 The twelve airfields of the New Forest area played an important part in securing the eventual victory, and with the coming of peace, in bringing home thousands of prisoners-of-war and service personnel, and opening up the new air routes across the globe, which we use today as a matter of course. They were involved in every aspect of air warfare from research and development, training, flying on both defensive and offensive missions and supporting the operations of secret agents and Resistance Organisations in occupied Europe. During the period around D-Day, in June 1944, many hundreds of sorties were flown daily from the twelve airfields, with the ‘Advanced Landing Ground’ at Needs Oar Point being the busiest airfield in the country, for around three weeks. With the pilots flying missions for up to eighteen hours a day from Needs Oar Point, the airfield saw an aircraft take off or landing as often as one every 45 seconds. Most of the 2000 personnel working on site lived in tents. All refuelling, re-arming and minor servicing of the ninety Typhoon aircraft was carried out in the open air, with supplies and equipment in the back of three ton trucks. Two open ended corrugated iron ‘blister’ hangars provided partial protection against the elements for major aircraft servicing. 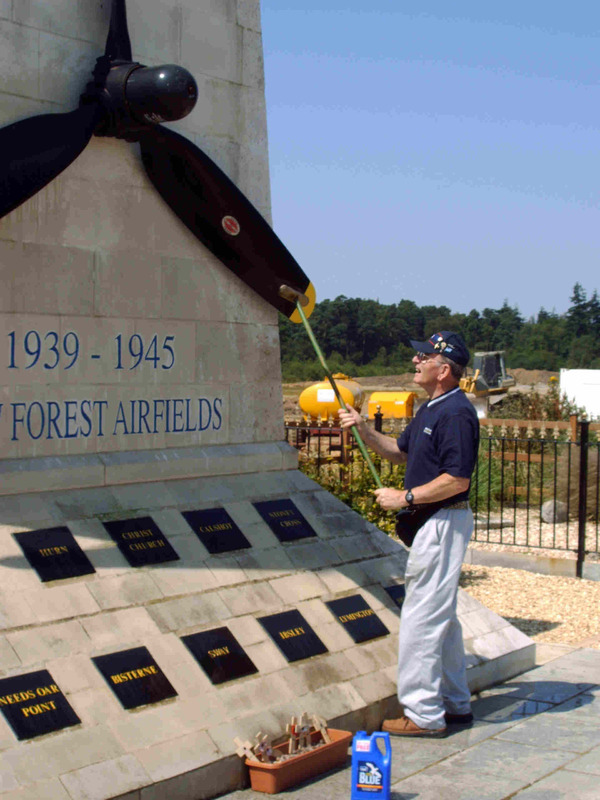 At that time, the service personnel working on the twelve New Forest airfields numbered around 20,000, with an additional 10,000 civilians supplying and supporting their activities. 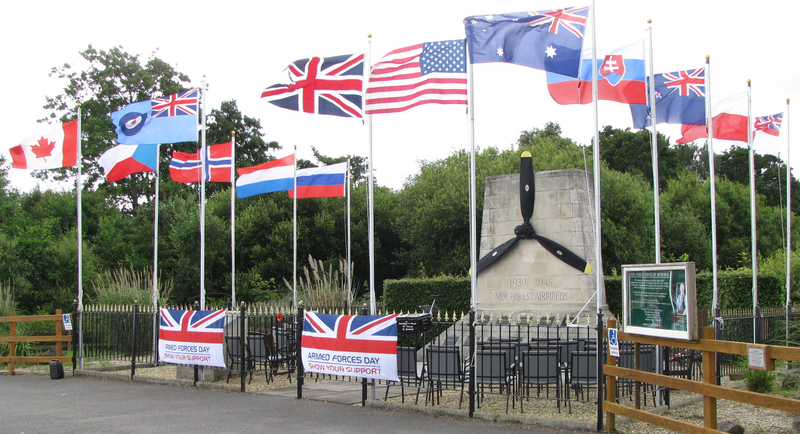 In addition to the Royal Air Force, units of American, Canadian, Polish, Australian, New Zealand, Russian, Norwegian, Dutch and Czechoslovak origin operated here and individuals concerned with the cause of freedom volunteered from such remote places as British Guiana and Ceylon. The fact that many civilians served alongside the Service men and women is often overlooked. The NAAFI girls manning the canteens, people like Harry Coker from Thorney Hill who operated a piggery at Holmsley South, civilian scientists engaged on experimental projects and many others were also actively involved. Everyone, fliers and ground staff, from the Commanding officers down to the lowliest “bog wallahs” (toilet cleaners) made their contribution and it is to remember them with pride and gratitude that the memorial was erected. and the work goes on………………. 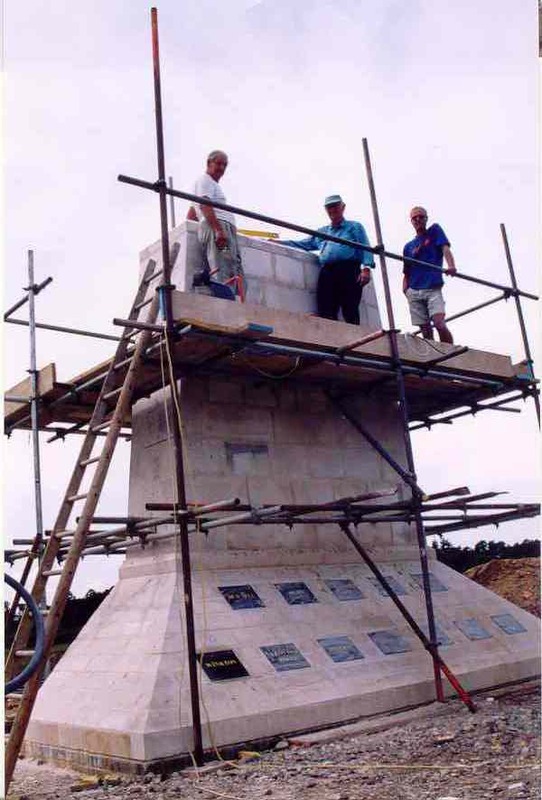 The Memorial is located on Black Lane, Holmsley South off the A35 between Christchurch and New Milton. Map OS reference SZ 208 987 Post Code BH23 8EB. The post code is for the Caravan Club’s Centenary Site, on Forest Road, nearby. 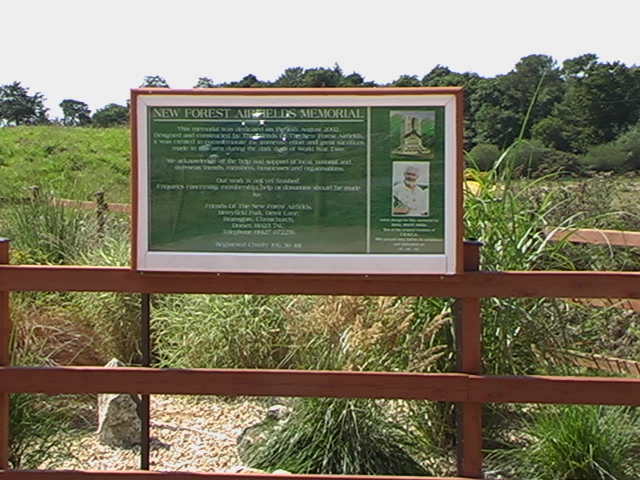 There are brown tourist signs to the Memorial on both the A35 trunk road and on Lyndhurst Road.